.... in a building that is now the Scientology headquarters. I grew up on L.A.'s Westside in Beverly Crest, a redheaded-stepchild community that shares Beverly Hills' 90210 zip code... without enjoying the fine schools that come with it. 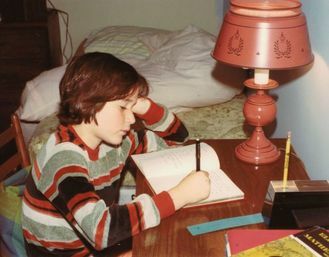 Some of my earliest memories involve books -- not just reading them, but writing them. They totaled well over a hundred. Story books, comic books, maze books, even a world atlas about countries that existed only in my head, in that same space where I imagined a wide expanse of readers beyond my own mom. Inspired by Charles Schulz' Peanuts, I considered devoting my life to drawing comics as I entered my teen years. Then my dad came home with a video camera -- a crude, Betamax camcorder. Suddenly, storytelling took on another dimension for me, one with real-life sound and pictures. After high school, I graduated with a B.A. in Communication/Media from UC San Diego, where I continued to hone my storytelling skills under a great documentary faculty. I enrolled in USC's School of Cinematic Arts, where I earned an MFA and won a student Emmy for my documentary thesis film, Taxi Dancer. After film school, I wrote several bad screenplays and directed a marginal feature (it sold in Slovakia and got into four festivals you never heard of) that left me heavily in debt. Realizing I needed a career, but unwilling to give up my dream of writing and directing, I turned to television. It was the smartest career move I ever made. I was able to rekindle my passion for telling stories and this time actually get paid for it. My TV career has taken me on some amazing journeys for networks like A&E, National Geographic, Discovery Channel, Fox Sports, VH1, Spike, Travel Channel, Science Channel, Cooking Channel, AMC, Sundance, and E! With TV as my "day job," I never lost sight of my dream to become an author. I began to write freelance articles on the side, first for the Los Angeles Times, then for other media outlets. In 2012, my first book was published: High Fives, Pennant Drives, and Fernandomania: A Fan’s History of the Los Angeles Dodgers’ Glory Years, 1977-1981 (Santa Monica Press). Based on audio tapes I recorded of Dodger games from my youth, it looks back at the Dodgers' last glory era through the radio calls of Hall of Fame announcer Vin Scully. It was chosen as one of the top baseball books of 2012 by the Daily News and earned praise from the LA Times, ESPN Radio, Fox Sports, NBC Sports, CBS Radio, American Public Media and Yahoo! In 2013, Perseus Books / Argo Navis published my first book of fiction: Skinny White Freak, a "coming of rage" Young Adult novel set in 1970s Malibu about a teenager working up the courage to confront a camp bully. The book’s story was inspired by my childhood. Like the protagonist Adam, I was a gangly, pasty-skinned kid, making me an easy target for ridicule, especially in the uber-tan, surfer-dude culture that defined the SoCal of my youth. Tapping my drawing background, I also created the 65 illustrations in Skinny White Freak. My next novel was Aramid (World Castle Publishing). It is set in the year 2080, when humanistic robots are an ingrained part of society. When a high school class of advanced robotics students are tasked with creating their own robot in a nationwide contest, things go horribly wrong after they try to retro-engineer the 'bot to fit their own nefarious needs. I have long been obsessed with man vs. machine stories -- Westworld being one of my favorite movies -- as well good sci-fi like The Twilight Zone, which are really morality plays dressed up in cool stories. I have also produced several science documentaries for TV, being lucky enough to meet brilliant scientists and engineers who, frankly, make me feel totally intellectually inadequate. Their work helped inspire and inform Aramid, which has picked up awards -- including First Place, Best YA Novel -- at several book festivals. My next book, 10,000 Steps A Day In L.A.: 52 Walking Adventures (Santa Monica Press) came out in the Fall of 2015. It was borne out of my obsession to obtain 10,000 daily steps on my pedometer -- a goal I noticed was shared by a lot of Fitbit-wearing friends. It occurred to me that, while there have been books written about 10,000 steps as a healthy lifestyle, no one had penned a book that mapped out 10,000-step itineraries in Los Angeles -- or any city, for that matter. This was the perfect excuse for me to fill this void, as it would also scratch my longtime itch to write a book about my favorite walks in my hometown while debunking the notion that Los Angeles is a city hostile to pedestrians. Somewhere in there is the spirit of Huell Howser, who truly was "amaaaaazing" in his ability to tap into the mundane and make it magical. The book is now in its second printing after regularly landing on the Best-Seller List, Nonfiction Paperback, for Southern California.